As far as I can tell, these are all from a guy playing the trial. They're real. I'm going to put this here because I love the sound of my own voice. Wow that red haired girl's design is loving awful. 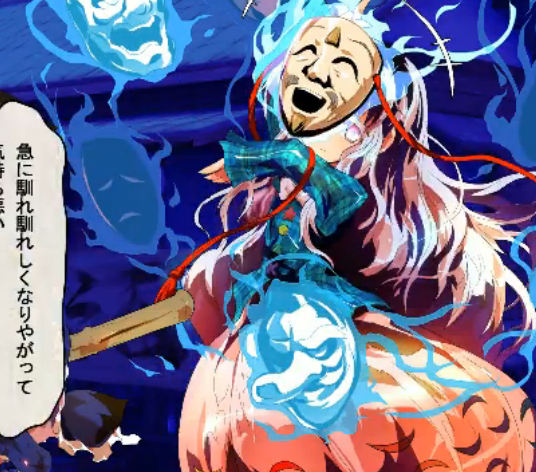 She's supposed to be a headless youkai thing. Which is why her neck is covered up. And she throws heads at you. Not sure if that makes it better, but that's what she is. In my opinion she looks cool and fashionable. 3rd stage boss is French??? So we have a mermaid, maybe a dullahan, and maybe a werewolf. These are all western monsters, and that might be the trend of the game. 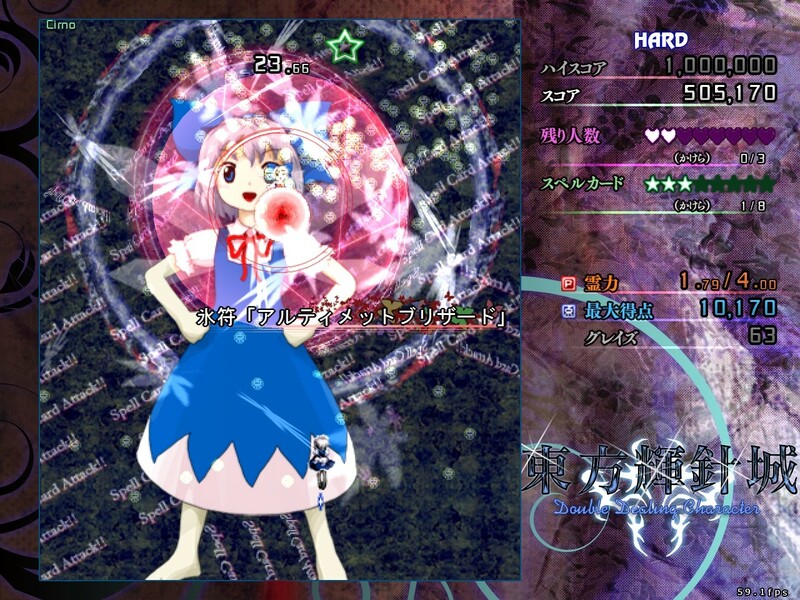 Final boss is Remilia guys, you heard it here first. Are there no pictures of the Stage 3 boss? For the record, her title is "Loup-Garou of the Bamboo Forest" and her name has the character for "wolf" in it. So she's a werewolf. Google translate says she's a were-canis lupus hodophilax, the extinct Japanese wolf. 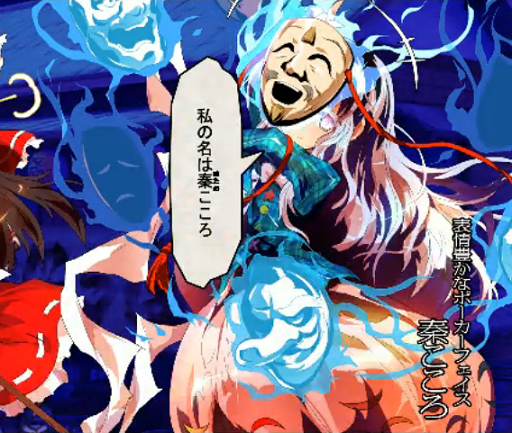 Well, at least the final boss of the fighting game looks pretty god drat cool. Tengu pride. She's got this whole "soldier" thing going for her. HM's boss might be named 心チャンス but I can't read Japanese. 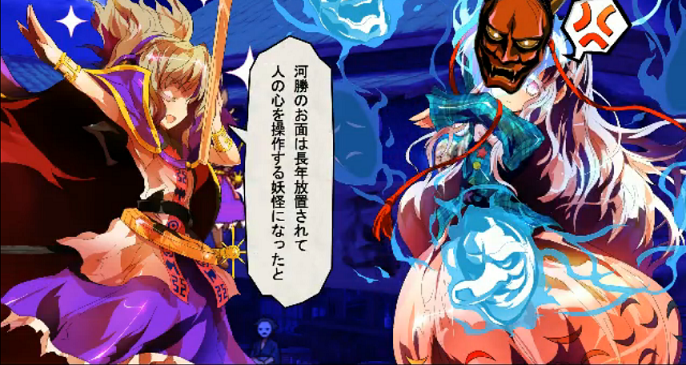 All of Miko's animations and portraits are gold. HM's boss is named Hata no Kokoro. 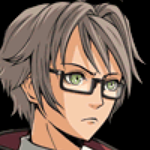 Kokoro is her given name. 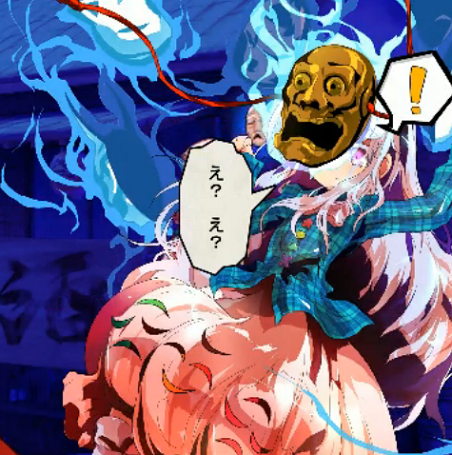 I like her, she is a very expressive youkai. Japan has a long history of mermaid stories. And headless women. Only the werewolf seems particularly Western. It should be noted that the character titles and song names combine Japanese and English terms for the monsters. 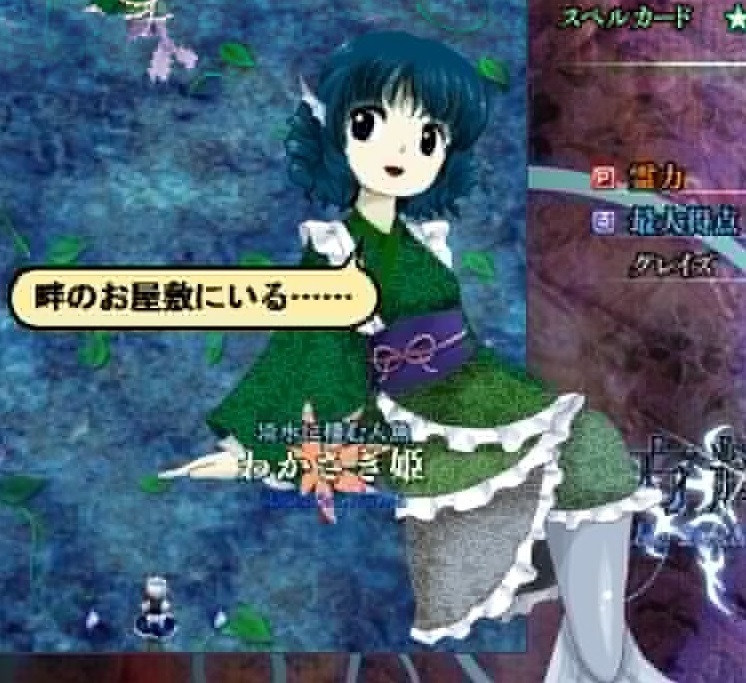 Wakasagihime's title uses "ningyo," and her music uses "mermaid." 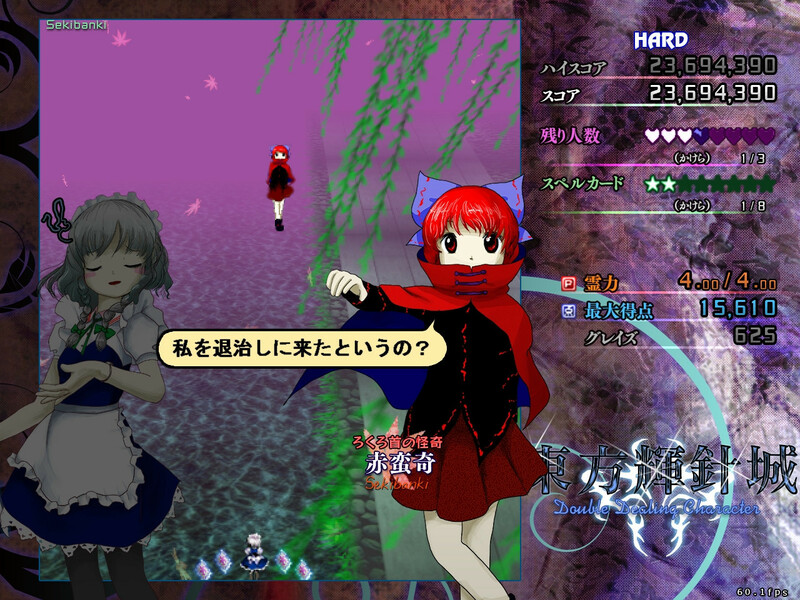 Sekibanki's title uses "rokurokubi," and her music uses "dullahan." 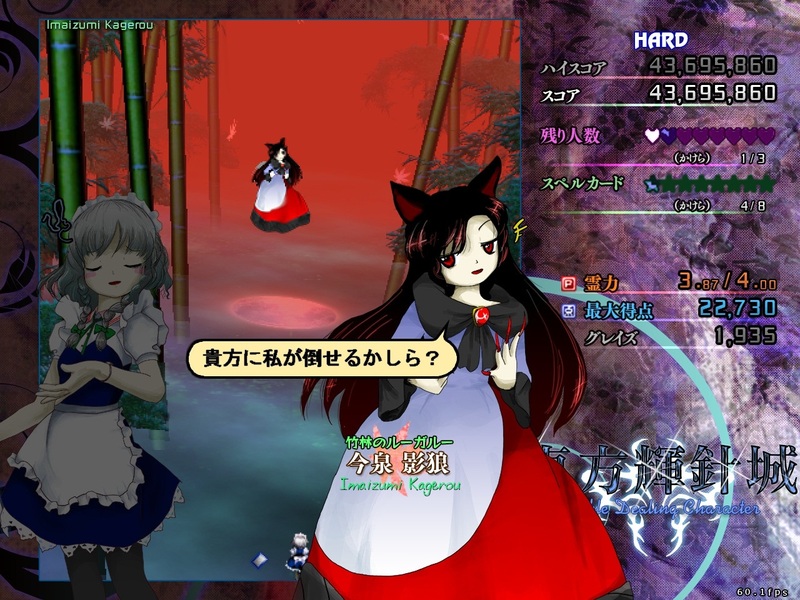 Kagerou's title uses "loup-garou," and I haven't seen her song name, but I'd assume it uses "werewolf" if it follows the same pattern. EDIT: Yep, called it, "Lonely Werewolf." Of course, "loup-garou" is not Japanese. Okay, I'm maining Nitori now. Also there's (I guess) this. I'm rather disappointed at this. All the fighting games had previously assiduously avoided this sort of fighting game trope, and it's unfortunate that they decided to start with this sort of thing now. Nitori's gadget copter rocks, though. EDIT: Goddamnit, now I have the Inspector Gadget theme in my head. It'll be forever associated with Nitori in my mind from now on. NWS? Pretty sure the white there is just her shirt. Disappointing that they have such gratuitous bouncing, yes, but I'm pretty sure that's not meant to be a chest window, if that's what you're getting at. The helicopter is indeed great, though. That's a pretty loving skintight shirt if it's going into her cleavage like that, then. I think you're in denial. Meh, just playing it safe. 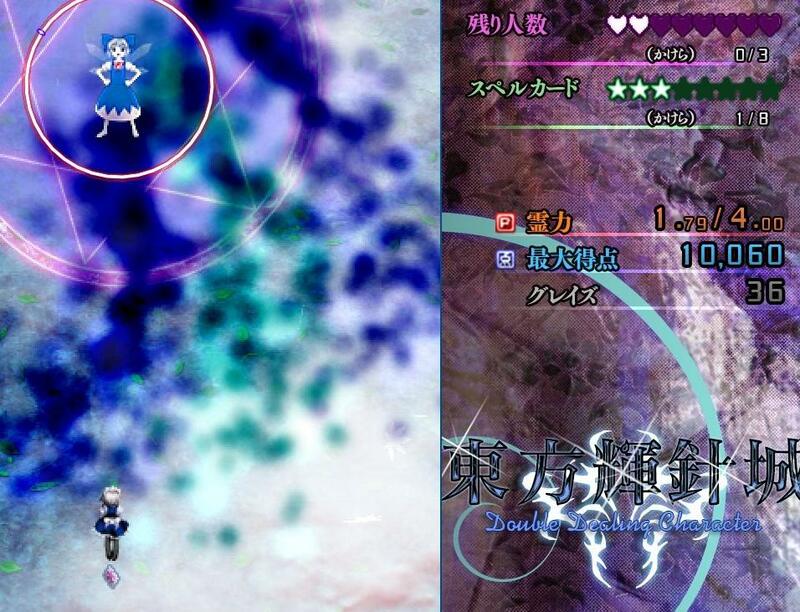 Anyways, you guys remember how one of Remilia's palettes looked like Flandre's, so you could pretend she was playable? Well you can do that again. 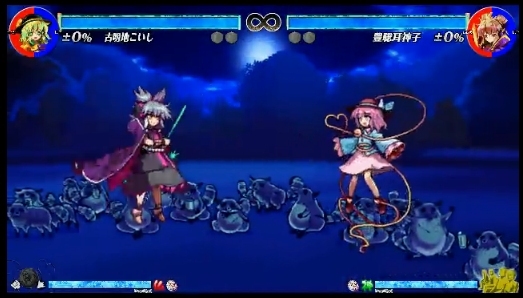 Also, Mamizou's stage is depressingly cameo-free. I've only seen a single play through on the campaign so I don't know how it works in stage select, but from I saw there was a day version of her stage where all the background tanuki were pretending to be other people (a random assortment from all stages). 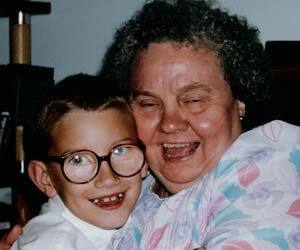 Oh my god, this loving video! Looks like a shirt to me. Is terrrrrrrrrible! It's like it's trying to be that Farming Simulator video but completely missing the mark(and humor)! Animes have shirts that completely wrap around the breasts. How it works I do not know. I'm not gonna bother looking up a specific example, but western media is just as guilty as anime. 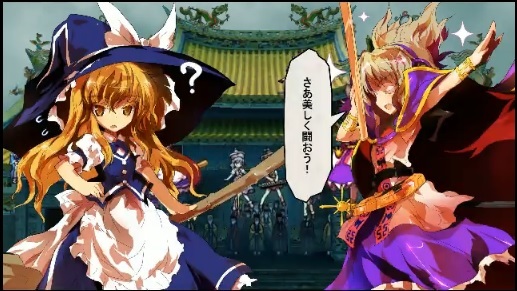 And screw the haters, I'm still using Byakuren first because her unique trait is still badass. Imaizumi's final spell is like a particularly dickish version of Cat's Walk. 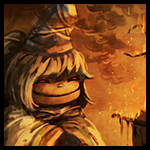 Having played as all of them now, I can safely say Byakuren's far and away the best character in Hopeless Masquerade. 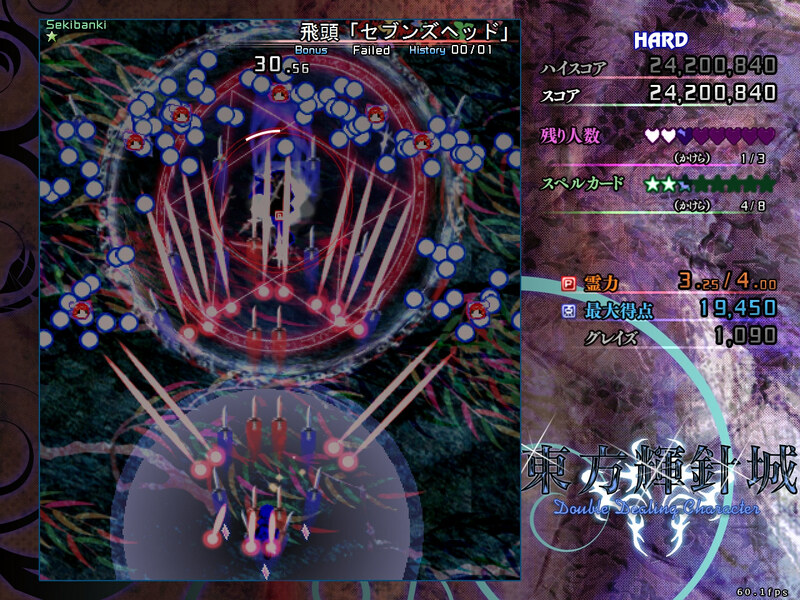 Got my rear end kicked by HM's final boss' third spell on Lunatic (though in hindsight I figured out a way to beat it), so I dropped down to Normal and... well, let's say this game takes after SWR in difficulty. I just mashed the gently caress out of the buttons and got a 1cc, no deaths. Most of the new arranges are pretty mediocre IMO. I'm liking the music. No idea what's up with the mechanics though. 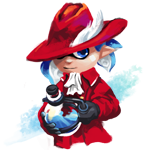 The game seems to be throwing bomb pieces all over the place, making fake shadow bullets and life pieces seem really rare. 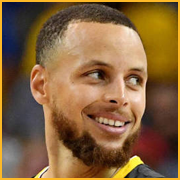 Something to do with points I think? 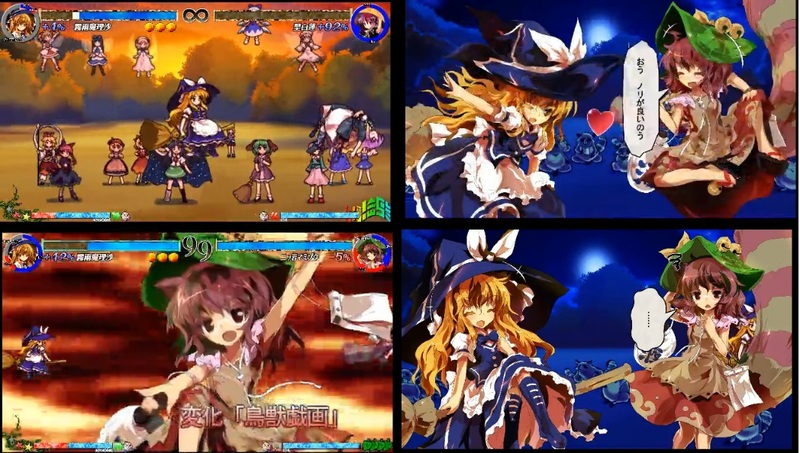 Miko has a badass cape she stole from Utsuho's closet or something, so she's clearly better than Byakuren.